For more than 30 years, the Pompano Beach Seafood Festival has been a celebration of everything that living or visiting South Florida is all about: an array of seafood that pleases every taste, over 140 arts and crafts booth, and of course, continuous music on three stages. However, it’s the festival location on the recently revitalized Pompano Beach that sets this festival apart from many other local events. This year, the Seafood Festival has a new layout that stretches along almost 2,000’ of oceanfront on recently restored Pompano Beach Boulevard. From just north of Atlantic Boulevard, past the Pompano Fishing Pier, nearly to A1A. There will be festival entrances on both the north and south ends with vendors on both sides of the beautifully landscaped sidewalk, creating an entirely new feeling with visitors strolling the length of the festival along the Atlantic Ocean. 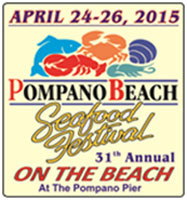 The heart of the festival at the Pompano Fishing Pier features over 30 Seafood Booths. Grilled, sautéed, fried. Fish, shrimp, lobster, crab, clams, mussels, conch, stone crab. Salads, fritters, paella, Cajun, jerk, oysters, raw and fried and much more. How would you like your seafood? Of course, there are also plenty of non-seafood selections. Gator, anyone? Buy your tickets at the door, no advance sales. $10.00 Friday kicks off at 5PM with Motown and Blues, featuring the “Blues Brothers Soul Review Tribute”. Rock and Roll Saturday with a variety of top local bands is anchored by two classic acts Saturday Night. Bad Company former lead Singer Brian Howe, followed by “Loverboy” (Working for the Weekend). Country Sunday – Offered for the first time this year Sunday will feature top local country acts, highlighted by 15 year old Emily Brooke (top 48 on this year’s American Idol). The Andrew Morris Band (a local favorite) will be performing, as well as a soon to be announced national closing act. There is limited parking in Municipal lots at the Pier, at Atlantic Blvd. and A1A, and west of A1A at N.E. 2nd Street. West of the Intracoastal, there is parking in a number of lots and a free trolley service will bring visitors to the festival entrance. What happens to the revenues from the Festival? The Seafood Festival is a not-for-profit corporation that benefits a wide variety of charities and civic organizations. Pompano Beach High School, the Boy Scouts, Blanche Ely High School, Exchange Club, Pompano Proud, the Greater Pompano Beach Chamber of Commerce, the Pompano Beach Fishing Rodeo, Women in Financial Services, Kiwanis, Rotary, Soroptimist, and others supply volunteers and share the profits. Over the years hundreds of thousands of dollars have been raised for all these groups. Visit www.pompanobeachseafoodfestival.com for complete information or call 954‐570‐7785 or the Greater Pompano Beach Chamber at 954-941-2940.